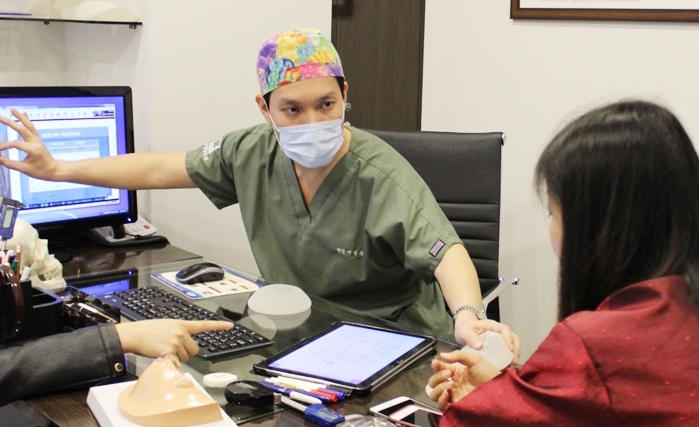 Dr. Lee Sung Wook from Mine Plastic Surgery sheds some light on breast surgery method. According to him, breast surgery should not always be considered during summer. Many people decide to go for breast surgery in winter to easily wear tightly-knitted clothes & to be prepared for the next summer. He questioned that you consider the breast molding to form an “S”line body shape, right? Well, then again he opined that the surgery result can be different depending on patient’s condition & detail. So a perfect plan & perfect implantation is the most important fact of that surgery. Mine Plastic Surgery has a special exfoliation skill without bleeding called Drypocket by HD endoscope. It helps form a better breast & texture with less pain & the highest safety. He assured that there is no bleeding, so you don’t need to wear blood bag after the surgery. In addition, no need of hospitalization as there is fast recovery, because an excess edema or pain by bleeding is remarkably low. He denoted that they perform back side exfoliation, which doesn’t bring neurological damage, & prevent weird or uneven shape of the breast. Safety is the very first priority, because the breast is not only to be aesthetically beautified, but also the fact that it is a crucial organ of a woman that is connected with the functions. He signifies that a highly-skilled specialist for the surgery is a must to determine first & then to go on with a optimal program, precise planning with meticulous analysis & overall management in all the stages as in pre-operation & aftercare to get the best results.